Editor's Note: The following is an extract from N.A Baloch's 'The Great Books of Islamic Civilisation'. 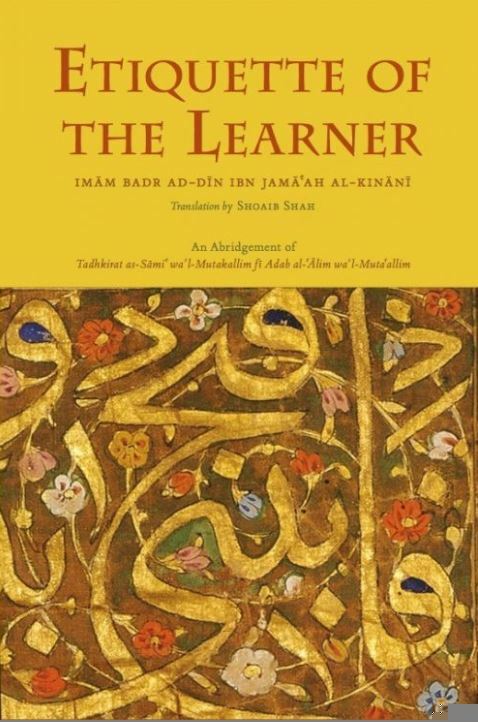 This is a short summary of Ibn Jama'ah's 'The Discourse of Listener and Speaker on the Etiquette of Learning and Learner'. 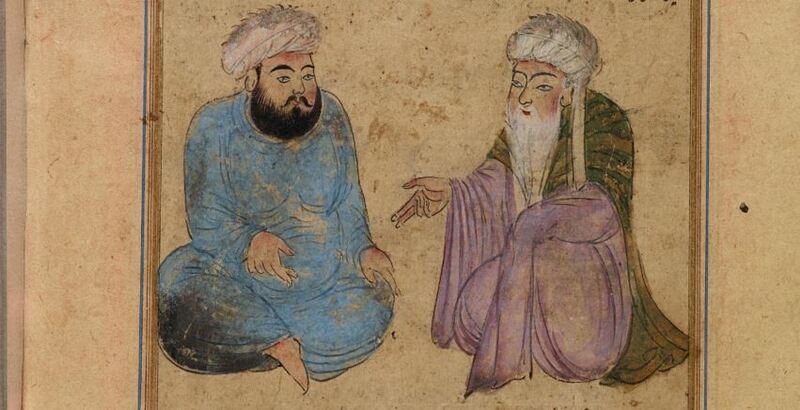 The author Qadi al-Qudat, Shaikh al-Islam, Badr al-Din Muhammad b. Ibrahim b. S'adullah Ibn Jama'ah was born in the family of the Arab stock of Kinanahat Hama (Syria) in Rabi- II, 639 A.H. (1241 A.D.). Hence he is also known as 'al-Kinani al-Hamavi'. He was educated at Hama, achieved excellence in religious studies and jurisprudence, and became an exponent of the Shafi'ite legal system (hence known as ‘al-Shafi'i’). Eventually, he attained the high status of Shaikh al-Islam and held the high position of Chief Justice (Qadi al-Qudat). Dhahbi has observed that Qadi Ibn Jama'ah was well versed both in prose and poetry, and had left copious notes (ta'aliq) on Fiqh, Hadith, Usul al-Fiqh, and Tarikh. He commanded respect and influence, and had a large number of students and followers. He died in Cairo in Jumada-I in the year 733 A.H. (1332 A.D.), aged 94, and was buried by the side of the great Imam Shafi'i. Not much is known about his biographical details but the study of his book Tadhkirat al-Sami' wa al-Mutakallim fi Adab al- 'Alim wa al-Muta'allim (`The Discourse of Listener And Speaker on the Etiquette of Learning and of Learner') would indicate that he was closely associated with the teaching profession and was fully aware of academic life and work of teachers and pupils in educational institutions. It was in the year 672 A.H. (1273 A.C.) that Qadi Ibn Jama'ah completed his TADHKIRAH as a guide for students and teachers to help improve quality of their academic life and work. I. Superiority of knowledge and the exalted position of those who possess it, and of the learned. II. Qualifications of the teacher - how he should conduct himself and his classes, and treat his students. III. The manner of the student - by himself, and in his relation-ship with the teacher who guides him and with his fellow-students. IV. Being in company of books and the related obligations. V. Etiquette of residence in the Madrasahs, for the beginners and for the seniors. Ibn Jama'ah places a high premium on personal and professional qualifications of the teacher, his main responsibility being the promotion of student welfare and advancement of knowledge. He must shun pride and arrogance, should meet people with a smiling face, help the needy and hold students in affection. 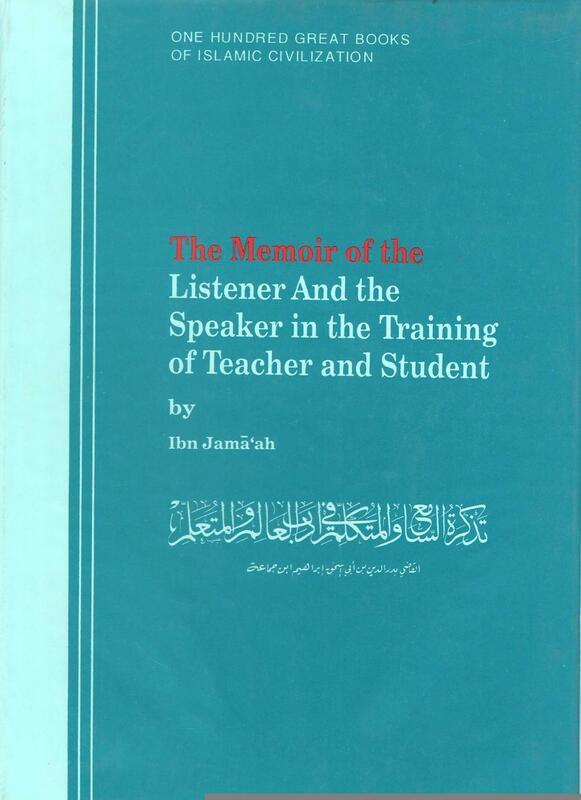 In methodology of teaching, Ibn Jama`ah has attached special importance to the teacher's class discussion - and hence, probably, `Speaker' and 'Listener' being the two key words in the title of his book. He recommends that the teacher should encourage students to ' ask questions, and help them to formulate their questions properly. He urges the student that when he asks a question he should do so politely without any affront to the teacher. The teacher should not be satisfied merely by giving a lecture but he must assure himself that the students have followed. However, to ascertain this he should not put direct questions: rather during the course of a new lecture he should raise questions the answers to which would involve previous knowledge. If a student is shy and sensitive, response may be elicited by indirect questions, so that the student does not feel that he is being subjected to a test. Instruction should commence with simple manuals. The teacher should motivate students in the best possible manner and create in them love for knowledge. When a student comes for admission, the teacher should first assess his capacity. Also the teacher must fix the class hours according to the convenience of students, and that the teacher should not be paid if he would teach either before sunrise or in late afternoons. Appointment of the teacher should be made very carefully. No person other than an authority in the subject should be permitted to teach it. If any leniency is shown in this matter, it will be a mockery of religion and learning, and a fraud played upon the people. Sincerity of purpose and clean personal conduct are essential for the student to succeed in the programme of studies. He should exercise moderation both in eating and sleeping. He should accommodate the teacher, should not feel shy in asking questions but should raise questions politely and should not interrupt while the teacher is explaining. The student must see to it that what he commits to memory is correct and authentic. He must be punctual and must stick to the class and to the programme of instruction. Detailed observations are made on the choice and study of books on lending, borrowing, purchasing and transcribing books. The fifth chapter deals mainly with the choice of an educational institution by the scholar and the requirements of residential life. The nature of the higher educational institutions (madaris) and their curricula for the beginners and the advanced classes are discussed enabling the student to make a judicious choice of the institution and the programme of study. The residential life of scholars and conditions of residential accommodation are explained and the need for a proper choice of a residential companion is stressed. The manner of entry into and exit from the residential institution is brought under discussion. 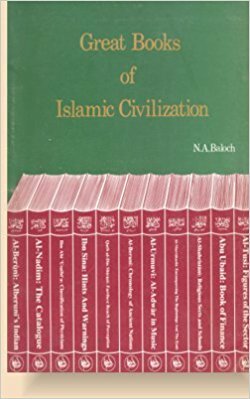 Each of the five long chapters of the book is sub-divided into a number of 'sections' (anwa'), and each section (nau') is loaded with considerable detail on the subject concerned as well as the supporting references from the Islamic educational tradition. As such, Ibn Jamaah's work is important both from the point of educational as well as cultural development. In the domain of pedagogy, Ibn Jama'ah may be regarded as a pioneer in the formulation of Question-Answer method as an essential feature of the teaching-learning process.